Just like airline pilots train on flight simulators, software learners need to learn in safe, realistic environments where they are free to make mistakes that won’t impact company assets. Fortunately for organizations, virtual training labs provide these safe realistic environments, but you need more than a bare bones virtual IT lab to run a successful, efficient training organization. If you’re in charge of deciding what type of cloud-based training solution to employ, you’ve probably done some background research already. You’ve asked what solutions your corporate training colleagues are using. You’ve checked vendor websites and reviews. Unfortunately, not all virtual training lab solutions are created equal. This brings us to the real challenge: How do you know what is the best solution for your organization? What are the key considerations you should look for? With so much information available today, we understand that selecting the right virtual training solution can be difficult and overwhelming. In our experience, clients who have the most successful virtual IT training programs are those who establish clear criteria before evaluating possible solution providers. To help simplify the buying process, we created a checklist for training leaders on what to look for when choosing a virtual training lab solution. In this buyer’s guide, you’ll find all the key information you need in one convenient place. As a bonus, we included a checklist broken down into three categories: The Training Experience, Architecture, and ROI – enabling you to clearly identify and prioritize your needs. Keeps you steps ahead of demands from your internal and external users today and lets you easily scale in the future. Our buyer’s guide delves into nine critical areas and covers features that are important for learners, trainers, course developers and managers. It explains, for example, the need for full classroom management functionalities that enable an experience on par with frontal teaching. We also highlight the need for a standards-based solution that is interoperable with the other solutions in your learning technology stack (e.g. your LMS) so you and your team can become highly efficient by automating processes across systems. 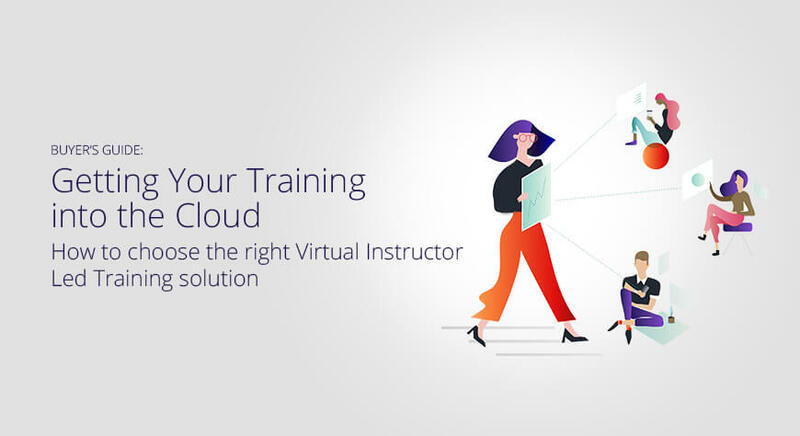 With more software and technology companies increasingly moving to virtual instructor-led training solutions to cost-effectively train employees, customers and resellers around the globe, selecting the right training partner has a profound impact on the success of your company. Take advantage of the helpful criteria and checklists in “Buyer’s Guide: Getting Your Training into the Cloud,” and build a successful training program for your organization.